Box Text: At the height of mankind's most glorious cultural and technological renaissance, the Earth is laid low by the Gurzons - a warlike and megalomanical alien race. Our planet's cities are shattered, and its population enslaved. 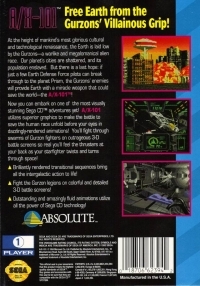 But there is a last hope: if just a few Earth Defense Force pilots can break through to the planet Prism, the Gurzons' enemies will provide Earth with a miracle weapon that could save the world - the A/X-101! Now you can embark on one of the most visually stunning Sega CD adventures yet! 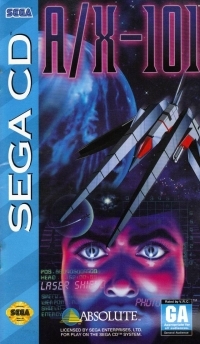 A/X-101 utilizes superior graphics to make the battle to save the human race unfold before your eyes in dazzlingly-rendered animations. You'll fight through swarms of Gurzon fighters on outrageous 3D battle screens so real you'll feel the thrusters at your back as your starfighter twists and turns through space! 10-26-2012 exonerator Box Text At the height of mankind's most glorious cultural and technological renaissance, the Earth is laid low by the Gurzons - a warlike and megalomanical alien race. Our planet's cities are shattered, and its population enslaved. But there is a last hope: if just a few Earth Defense Force pilots can break through to the planet Prism, the Gurzons' enemies will provide Earth with a miracle weapon that could save the world - the A/X-101! Now you can embark on one of the most visually stunning Sega CD adventures yet! A/X-101 utilizes superior graphics to make the battle to save the human race unfold before your eyes in dazzlingly-rendered animations. You'll fight through swarms of Gurzon fighters on outrageous 3D battle screens so real you'll feel the thrusters at your back as your starfighter twists and turns through space! 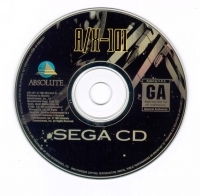 This is a list of VGCollect users who have A/X-101 in their Collection. This is a list of VGCollect users who have A/X-101 in their Sell List. This is a list of VGCollect users who have A/X-101 in their Wish List.